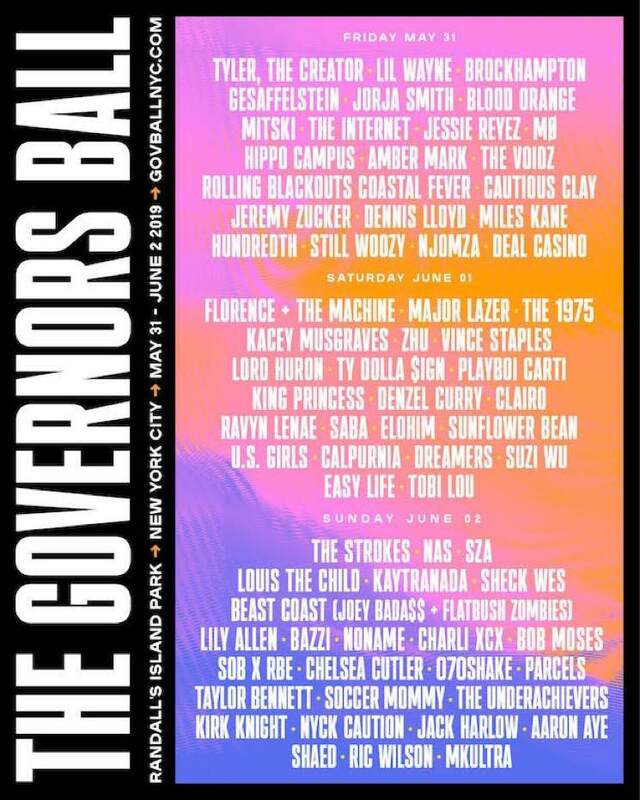 The Governors Ball will return to New York later this year, and the festival's lineup has just been announced. Tyler, the Creator, Florence and the Machine, the Strokes, Lil Wayne, Brockhampton, Major Lazer, the 1975, Nas and SZA are amongst the top-billed artists. Rounding out the lineup are acts like Gesaffelstein, Jorja Smith, Blood Orange, Mitski, the Internet, Jessie Reyez, Kacey Musgraves, Vince Staples, Ty Dolla $ign, U.S. Girls, Calpurnia, Louis the Child, Kaytranada, Sheck Wes, Lily Allen, Noname, Charli XCX, Bob Moses, Soccer Mommy and plenty more. The festival will take place from May 31 to June 1 at Randall's Island Park. For full festival details, including the complete lineup and ticket information, check out the official Governors Ball website. Nas Rolls Out Video for "Adam and Eve"
Nas Shares Video for "Cops Shot the Kid"
Julian Casablancas Thinks Streaming Services Are "a Waste of Time"
Julian Casablancas Just Delivered a Downer Version of "I Wish It Was Christmas Today"
Watch 2 Chainz's New Video for "2 Dollar Bill"
Hear Lil Pump and Lil Wayne Connect on "Be Like Me"